READER Jamie Chan from Damansara Jaya wants to know if there are any decent vegetarian food stalls around the township. Her email read: ?Dear Sam, do you know of any stalls in the Damansara area that serve vegetarian food? ?I read that you feature a lot of stalls that cater to meat eaters, but, how about vegetarians?,? she asked. Okay Jamie, you are in luck! I chanced upon a vegetarian chap fan stall at the Golden Kim Wah coffeeshop in Damansara Kim (a small row of shops opposite Damansara Utama). The real purpose of my visit was to check out a stall selling Kampar noodles, but it was closed. So, my choices were limited to fried noodles from Robert Char Koay Teow or going ?pure? 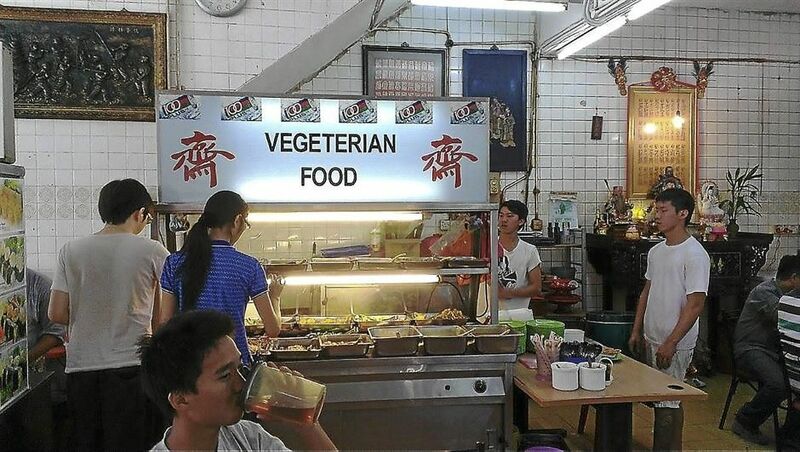 by having vegetarian chap fan. 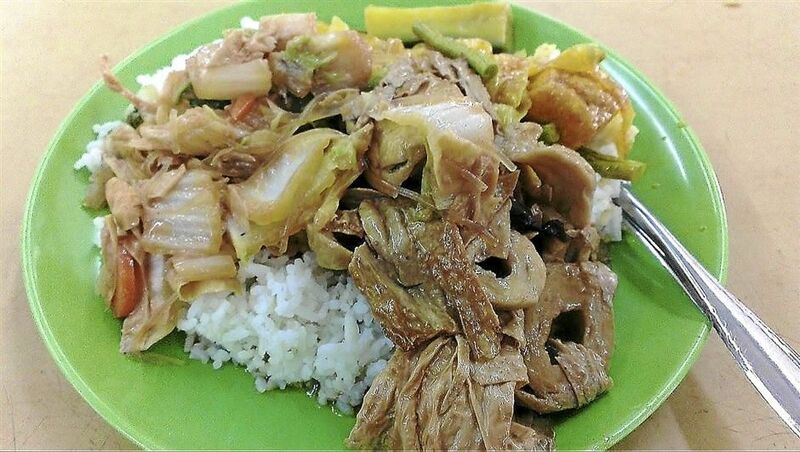 Simple and cheap: A vegetarian chap fan meal that?s under RM5. From what I observed, the chap fan stall was doing rather okay. There was a stream of customers scooping vegetarian dishes ranging from curried vegetables to mock fried goose and mock fish fillet. What I found interesting was the reasonable pricing. A plate of white rice with three dishes ? vegetable curry, mock pig?s intestines, stomach and chinese cabbage with foo chok and mung bean noodles ? came up to RM4.80, with an additional 50 sen for a glass of Chinese tea. This is by far one of the cheapest makan places in Petaling Jaya because such meals would easily cost about RM7 per serving. Taste-wise, I would say it?s just average. On the Samo-scale, the vegetarian chap fan would rate a 4.8 out of 10. Why? Because the benchmark for such a meal is the vegetarian stall at Sungai Wang Plaza?s Level 4 food court. So far, this is one of the best in the Klang Valley. Golden Kim Wah coffeeshop (GPS 03 08.073, E 101 37.545) is located off Jalan SS20/11 in Damansara Kim and is open from 7am to 7pm daily.